Hello, again friends!! I can’t stop with the seasonal recipes over here! We are loaded to the brim with tomatoes and basil from the garden, so these tomato basil noodles are an absolute staple at our house. The flavors compliment any dish making it the perfect addition to your recipe arsenal! But what’s even better than seasonally fresh? Kid friendly! Last week I talked to you about my children not quite appreciating the concept of seasonal eating, but this is a recipe they are completely behind. They request them. They devour them. And I rejoice in a dish that is easy and approved by the whole family! Yes, mamas, you read that right. This recipe pleases 6 out of 6 in this house…if you’re cooking for a family, you know just how miraculous a 100% approval rating is! 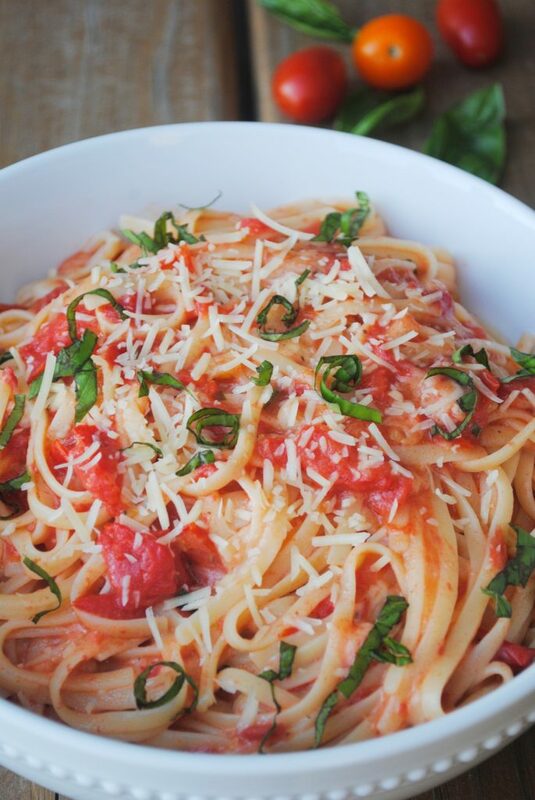 I will give you a tip though, when you’re serving this dish to your guests, by all means, call it tomato basil noodles. But when your serving this to your kiddos at your next weeknight meal and they ask what you’re making: call them cheesy noodles. If your kids are anything like mine, they flinch at the sound of anything too different, too healthy, or too fancy. But all dishes with the words cheese and noodles in them are happily received! These kiddos have been chowing down cheesy noodles for years. And love it! While garden tomatoes and fresh basil take this dish to a whole new amazingly delicious level, you can serve this year round. You can also easily adapt the recipe to suite your needs or your tastes. It is one of those, fast, easy sides that you can’t really mess up. I call these give or take recipes. You don’t have to be precise with measuring. The amounts are not set in stone. Throw it all in. A little more or less of anything won’t hurt a thing. It ends up tasty every time. This is my kind of cooking. The directions are simple. Grab your ingredients and get some water boiling on the stove. While you’re waiting for your water to boil, prep your ingredients. Dice your tomatoes. If you’re using fresh basil, stack the leaves and roll them up to chiffonade (slice in thin strips). Mince your garlic (pre minced works just fine). Once your water is boiling, place your linguine noodles in the pot, and cook your sauce while the noodles boil. 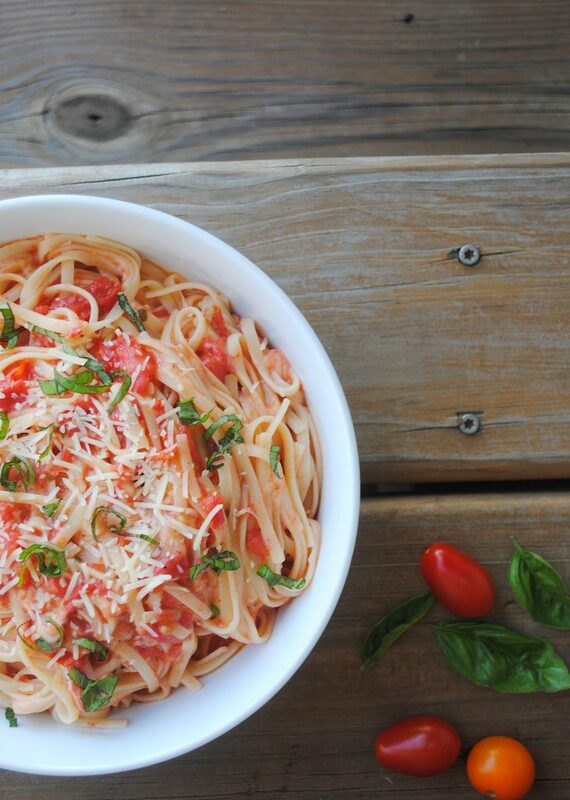 You can sub any kind of thicker pasta you have on hand for the linguine. However, thin strands like spaghetti noodles won’t hold up to the cheesy goodness, so make sure it’s a noodle with a little more density. Cook pasta according to package directions. Place olive oil, diced tomatoes, basil, garlic, salt and pepper into your pan on medium heat bringing it to a simmer. Back down your heat and stir frequently for 5-8 minutes. Combine noodles, cheese, and sauce; toss and serve. Start water boiling on the stove. While you're waiting for your water to boil, prep your your ingredients. If using fresh basil, stack and roll leaves to chiffonade (slice in thin strips). Mince garlic (pre minced works just fine). Cook your linguine according to package directions. While your noodles are boiling, cook your sauce. 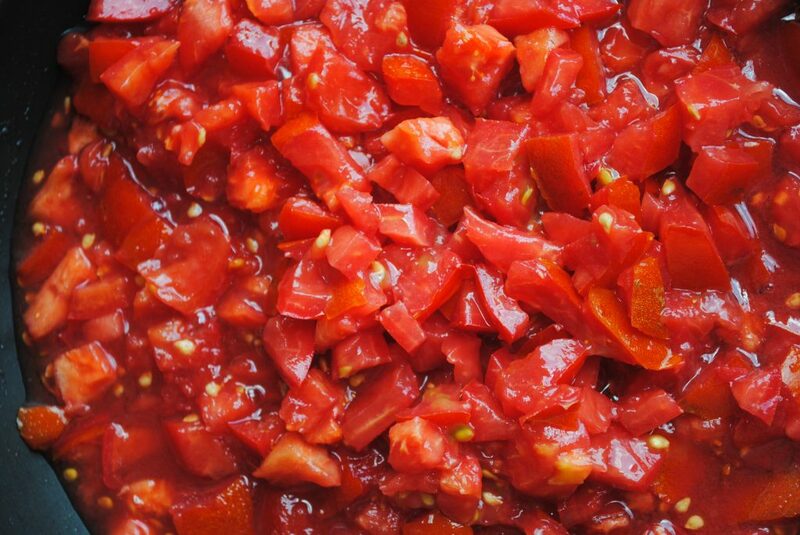 To cook sauce: Place olive oil, diced tomatoes, basil, garlic, salt and pepper into your pan on medium heat. Back heat down to medium low and stir frequently for 5-8 minutes. Combine cooked noodles, cheese, and sauce; toss; and serve. This side tastes amazing with grilled proteins or zucchini meatballs. If you’re looking for a gluten or grain free option, serve the sauce with these zoodles. Check out these roasted asparagus or peach caprese salad, and 5 minute salsa recipes for more tasty side dishes. 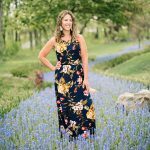 Mama In The Midst contains affiliate links! Thank you for clicking around my site!! Thank you!! we think so, too! Anything that everyone will eat is going to be a staple at our house! Can’t wait to try this! Exactly!! It is cause for huge celebration when I can get every on board with a meal!! The fact that it’s healthy is an even bigger win!!! Can’t wait to hear how you like it!